Neutrinos are amongst the most abundant particles in the universe and are mainly produced in the nuclear reactions that make stars shine. 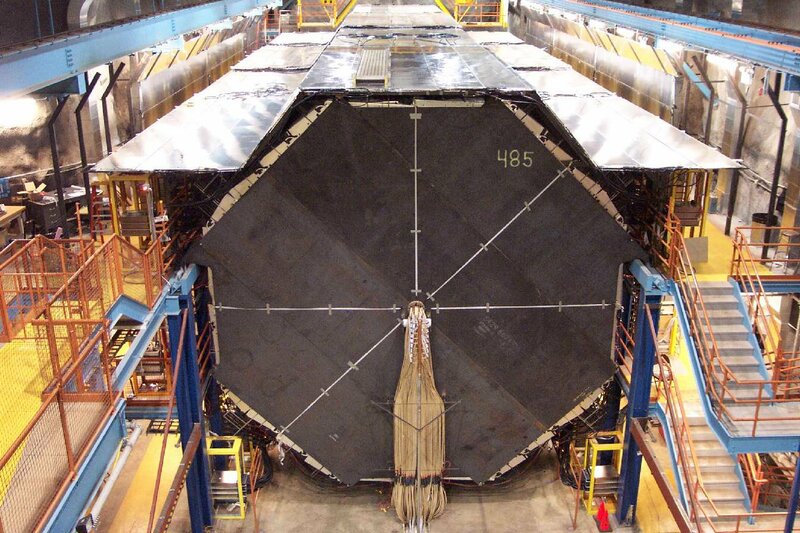 Every second billions of neutrinos pass through our bodies. Neutrinos are tiny subatomic particles that carry no electric charge and only very rarely interact with matter. A neutrino could pass through a light-year of lead without interacting, so to study their properties, physicists need to detect a large number of them and so need a big detector. There is now evidence that neutrinos have mass (albeit a minuscule one) and that they oscillate between flavours as they travel (the three neutrino flavours are the electron, muon, and tau neutrino). The MINOS Far Detector in the Soudan Mine. MINOS was a long baseline neutrino oscillation experiment that took data from 2005 to 2012. It used the neutrinos from the purpose-built NuMI beam in a mostly low energy configuration, with a beam peak at approximately 3.5GeV. MINOS was then reborn as MINOS+ in the medium energy NuMI beam currently used by the NOvA experiment. MINOS+ finished taking data in June 2016 and this data is still being analysed today. 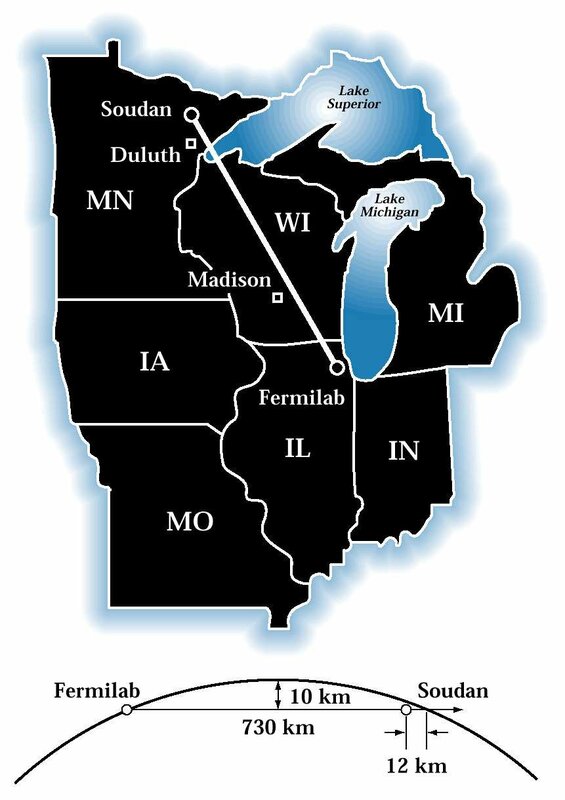 To provide neutrinos for MINOS, an intense beam of neutrinos, the NuMI beam, was built at the Main Injector particle accelerator at Fermilab (near Chicago), and travelled 735 km through the earth to the Soudan mine in northern Minnesota, where the MINOS Far Detector was located. The beam is still running, in fact it is the most powerful neutrino beam in the world, and it is mostly made of muon neutrinos with a small background of electron neutrinos. The energy spectrum of neutrinos of each flavour (electron, muon, tau) was measured in the "Near Detector" at Fermilab and the "Far Detector" in the Soudan Mine. MINOS then compared the spectra measured in the two detectors to understand if the flavor content of the beam changes as it propagates and, if so, how the changes depend on neutrino energy. The data was then used to exclude alternative theories and confirm neutrino oscillations, and to provide the world's best measurements of the atmospheric mass difference as well as groudbreaking new results for anti-neutrinos and sterile neutrinos. MINOS has exceeded many expectations in the physics results it has produced, and it still producing results today. The UCL MINOS group has been involved in the vast majority of MINOS and MINOS+ analysis, from humble beginnings with the MINOS Calibration detector through the final data taking with MINOS+. The group is still involved in final data analysis at present. You can learn more about MINOS here. For more information about MINOS at UCL please contact Prof. Jenny Thomas, Prof. Ryan Nichol or Dr. Anna Holin. 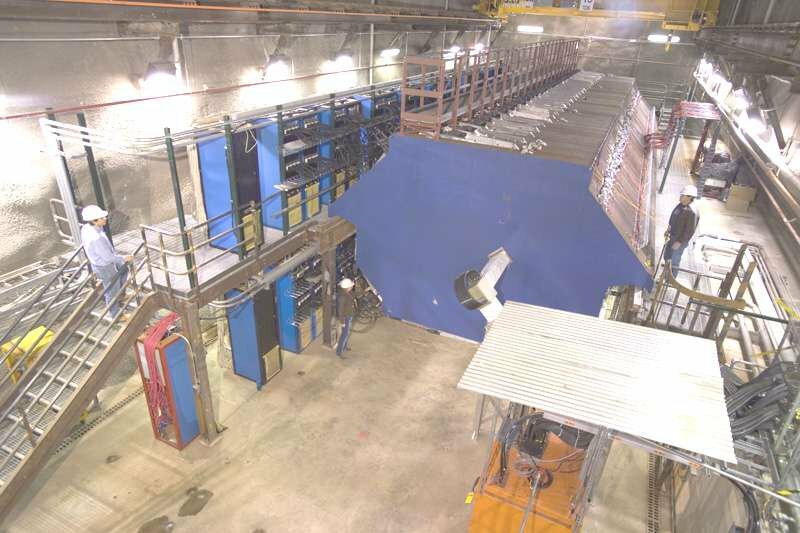 MINOS Near Detector at Fermilab near Chicago.